If you want to eye some of the be-trunked artworks up close, head for LA Live. Seven "life-sized" baby elephant sculptures are on display at LA Live from Oct. 23 through the 25th. They're part of the larger, traveling-the-world art set called The Elephant Parade. Kitten videos are rightly held sway on the internet for lo these many years now, but here's hoping that baby elephants soon share that viral throne. Just about every clip of a wee pachyderm entwining his trunk with his mum's gets thousands upon thousands of views. Our shared human love for all things trunky is surely one thing that is bolstering views on another current favorite, though this one is happening offline. It's The Elephant Parade, a large group of life-sized baby elephant sculptures that are on a grand world tour. But not just for views nor camera snaps; the artworks were created to "help raise awareness about the creative campaign focused on saving the Asian Elephant." Seven of the colorful and pizzazz-pretty baby elephant sculptures are on view at Nokia Plaza on LA Live from Wednesday, Oct. 23 through Friday, Oct. 25. There are more elephants in the Elephant Parade: Welcome to America show, and they're not too far from LA Live. They're on view in Dana Point through Nov. 7, with closing ceremonies happening the week after. So you've viewed the pachyderm-delightful pieces and you want to do more? There's an Elephant Web Shop, where twenty percent of proceeds on purchases go the help-out campaign surrounding the Asian elephants. 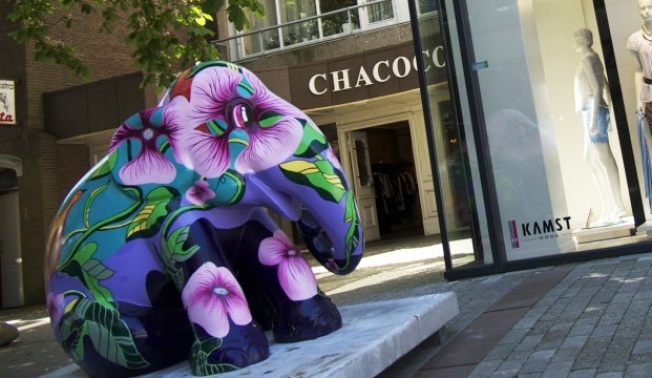 To learn more about the globally minded effort, you can go straight to the Elephant Parade HQ.